Two bed cottage on one level only a short drive to the fantastic beaches at Plouhinec or if you want to venture a bit further take a drive to Quiberon and the Gulf of Morbihan.. 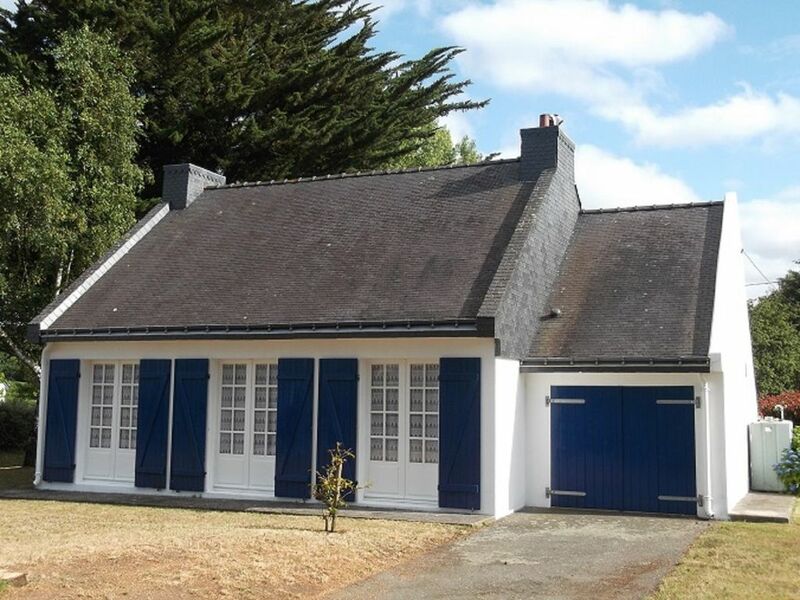 Located on the Ria D'etel and a 15 minute walk to a sea kayaking school.Just outside the village of Sainte Helene this is an ideal base for exploring the Morbihan coast.The house has two bedrooms with two singles in one and a double in the other. Shower room and seperate toilet. Towels included. Two Twin leather couches. flat screen tv with English channels on freesat. Dvd player with selection of dvds. Wi-fi . Bookcase with selection of books and some boardgames. Large private garden surrounding house. for children to play. There are plenty of walks surrounding the property, giving easy access to the many coves and inlets in the area. We had a couple of minor issues during our stay hence the 4 stars, but that would not deter us from booking this property again. Thank you Richard and Janet for your honest review. It was a pleasure to have you as guests. We are constantly striving to improve things and the washing machine has been retired for a new model. Hope you will stay again in the future. We stayed here for one week . Everything was perfect really. Good, friendly and quick response from the owners- for any queries. House in lovely quiet location, yet within walking distance to nice and friendly village. A couple of minutes to the water front. Fantastic paths through woods and fields for nice walks. Very good base for exploring the Morbihan and nothing seemed very far away. The house was well enough equiped and freshly decorated . Decent and comfortable bed ! ( thank you !! ). Nice garden for relaxing in . Would love to come back again . Wouldn't hesitate to recommend. !! A delightful gite in a lovely rural location close to the Ria D'Etel. Very pleasant and well equipped gite. This makes an excellent home for a holiday and enjoys a great location in a rural setting near to a village with facilities and not far from the estuary. Great opportunities to cycle, walk and kayak within the immediate area. We particularly enjoyed exploring the quiet rural lanes and discovering access points to the Ria D'Etel. Yellow Hammers in the garden daily offering their song of "little bit of bread and no cheese!" Great local markets and a useful information pack in the gite giving details etc. Cottage was clean and homely and well equipped with everything you need and more even down to picnic baskets and beach mats.Great garden with loads of room for kids to run around and games and dvds to keep the kids occupied.House is in beautiful countryside yet only few minutes drive to gorgeous sandy beaches and village is within walking distance with lovely fresh bakery and bar/creperie.Great location for exploring Brittany and will defintely go back again as so much more to see and do. The cottage was in a lovely location, it was clean, well equiped, with everthing you need. We had a wonderful week in the cottage, it was handy for the sea side, and historical towns and cities. The cottage had leaflets to help you and also good maps. The cottage was clean and fulfilled all our needs. Our French family thought it was exceptional. We spent a week here and had a lovely time exploring this beautiful, undeveloped part of Brittany. My husband has a small boat which he was able to get into the water very easily just a mile along the road from the cottage (the Ria d'Etel - in fact the whole region - is great for boaty folk). The cottage was very clean and simply but pleasantly and comfortably furnished for four people and had a good stock of DVDs, books and games as well as good satellite TV and Wi-fi connection . The kitchen had everything we needed to self-cater and it was handy having a separate shower and toilet (although the latter was a bit short of leg-room for my tall husband!). For families there's plenty of outdoor space for children to play and a nice terrace for outside dining. In a nutshell, we found the cottage met our needs very well and we would recommend it. Sea Kayaking available within 1 mile of the house . Perfect for exploring the Ria D'Etel and the stunning St Cado.